There are so many great shopping options at Disneyland that narrowing it down to essential items that stand the test of time can be overwhelming! That’s where we come in. Here are the top seven souvenirs ranging in price options you can buy at Disneyland that you will treasure for years to come. The Disney Store website sells Disneyland items at a discounted price. Purchase some early and use the items to get your family excited about your trip. Don’t Forget Your Magic Shots! Be sure to check out the ultimate guide to Disney Pin Trading. Since the beginning of Disneyland, the classic black Mickey Mouse ears have been the perfect souvenir. While Disney does sell crazy looking themed ears, I suggest sticking with all black. Have the entire family purchase ears and get each of your names embroidered. The Mad Hatter Shop: This crazy hat store actually has two locations. One on Main Street just as you enter the park, and the second in Fantasyland adjacent to the Mad Tea Party. Hatmosphere: This small hat shop in Tomorrowland is another great place to get your pair of Mickey Ears and have them embroidered. After you have your ears, take fun pictures of the entire family from the back or the front. The pictures come out beautifully from the back, as seen above. On Main Street in Disneyland, visit the Disney Silhouette Studio and get a hand-cut a silhouette of you or your child’s head. For $9.45 a person you get two identical copies of your silhouettes. Around the park there are machines that will press your penny into a design representing Disneyland. For example, in the shop next to Pirates of the Caribbean a guest can get a penny stamped out to have the “Dead Men Tell No Tales” saying imprinted. To get a pressed penny it costs 51 cents. One penny to get pressed and two quarters to pay. Make sure that you have shiny pennies, because the designs look the best on those. There are also pressed quarter machines that cost more. Purchase a pressed penny book in Disneyland to collect pennies from all of the machines around the parks. 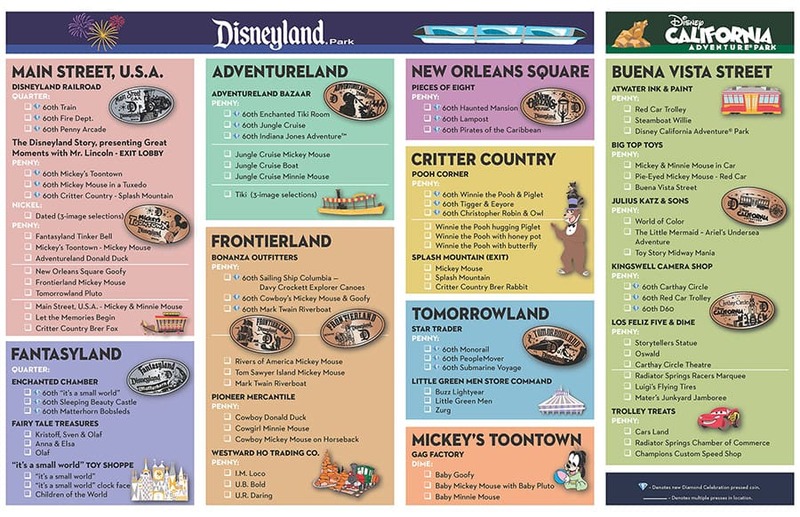 If you visit Guest Relations at Disneyland, you can pickup a map of all of the different locations to get a Disneyland pressed penny. In Disneyland adjacent to the Matterhorn and at a kiosk in Downtown Disney, Disney sells watercolor paintings of your name. The price is about $5 per letter. Each letter is illustrated to look like a certain Disney movie or Disney character. One letter name squares are also available. Lockers are available at both parks for $7-$15 per day in both of the theme parks. Throughout Disneyland and Disney California Adventure you will see Disney characters. These characters are all available for photographs and most will also give you their autograph. The Disney Characters will give you a fun Disney autograph. It is a very good idea to have a Disney autograph book to keep all of your autographs in. Autograph books can be found on Disney Store.com –I suggest purchasing one online in advance to save time and to choose the perfect one. When you are in the parks ask the characters to only sign their autograph on the right page and leave the left side pages open. Take a picture of your child with the character and add it to the left page. It makes for a great way to keep your photographs. One of the best souvenirs for remembering your trip to the Disneyland Resort are the pictures that you bring home with you. These pictures will last a lifetime in your family photo album and are something to cherish for years to come. Disneyland has their own crew of PhotoPass photographers strategically placed around the park and ready to take your picture. PhotoPass at the Disneyland Resort offers a variety of photography options for guests at Disneyland. We’ve put together an extensive guide on PhotoPass, the benefits of MaxPass, and tips for taking the best pictures at Disneyland. There are a variety of package options for PhotoPass at Disneyland and this can get a bit confusing for first time guests. Here are the different tiers of cost for PhotoPass packages currently available at Disneyland. Disney PhotoPass+ is a purchase option that includes all your PhotoPass photos linked to your Disney account for a seven-consecutive-day period. This will include all attraction, dining, and Magic Shot photos too! Digital downloads of all Disney PhotoPass photos from a seven day period. The cost of this PhotoPass option is currently $78. Before your visit if you have plans to do a character meal. You also have up to 45 days after your park visit to purchase your photos if you don’t buy them ahead of time or at the parks. You can buy this PhotoPass option on Disney’s PhotoPass website. One of the most confusing things about PhotoPass is the activation process. When you buy the PhotoPass package online you will be prompted to create a Disney account if you don’t already have one. Your PhotoPass package will be stored on your account. Once you go to your first character meal or get your first PhotoPass card from a photographer, scan that card into your Disneyland App account. Once you do that, our photo package will appear on your account with the option to activate it. Disney PhotoPass Collection is a purchase option that includes all your PhotoPass photos linked to your Disney account from a 45 day period. This will include all attraction, dining, and Magic Shot photos too! The cost of this PhotoPass option is currently $99. At your character meal if you plan on doing one. This package can only be purchased in the parks so you must buy during your park trip. This package can only be purchased in the parks at the Disney PhotoPass Sales Center, dining locations with PhotoPass photographers, and all attractions with PhotoPass on-ride photos. This is important! Make sure you do not activate this until after your trip. Once the photo package is activated, it will download all images up to 45 days prior to the activation date. Disney PhotoPass Collection + Disc is a purchase option that includes all your PhotoPass photos linked to your Disney account from a 45 day period. This will include all attraction, dining, and Magic Shot photos too! DVD disc with all Disney PhotoPass photos in your account at the time of purchase. The cost of this PhotoPass option is currently $119. Right when you enter the parks and before your character dining, if you have one booked. Go straight to the Disney PhotoPass Sales Center to purchase. This package can only be purchased in the parks at the Disney PhotoPass Sales Center. This is important! You must be in person to activate this PhotoPass package as the cast member at the PhotoPass center will physically hand you your DVD with your images burned on them. MaxPass has been a great addition for guests at the Disneyland Resort. You can read our extensive guide to MaxPass here. One of the best perks of purchasing MaxPass is the unlimited PhotoPass downloads that come with the purchase! For $10 a day per person, you have unlimited download access to all of your PhotoPass images including Magic Shots, attraction rides, and character dining. This is such a fantastic deal- we highly recommend it! Even if you have a large group and don’t plan on purchasing MaxPass for everyone, one person could purchase MaxPass on their phone just for the PhotoPass benefit and use that to download all the PhotoPass pictures onto their account. That’s a great savings which turns out to be a better deal than the PhotoPass+ one week option. Once you’ve selected your PhotoPass option, it’s smooth sailing to using PhotoPass at the parks. Typically, most character dining options will offer at least one PhotoPass photo before the dining experience begins. The photographer will hand you a card with a code on it to put into your Disneyland Parks App. I recommend saving all of these to put into your phone at once at the end of the day and not spend park time messing with them. Store them in a safe place for later! You can locate PhotoPass Photographers on the Disneyland Parks App to see which photographers are currently available. Don’t worry, they have the most popular photo spots covered! If you want a Magic Shot, you can ask the photographer if they don’t suggest it! A Magic Shot is where the photographer digitally inputs Tinkerbell or some other cartoon character into your image. These can be so fun! Once you exit the ride, you will be led to a room that has TVs on the walls displaying your attraction photo. Once you find your group, you will see in the bottom corner of the photo a code to put into your Disney app. I recommend taking a picture of this code with your phone so you can put the code in later. It is absolutely essential to have the Disneyland App on your phone for your visit. I recommend downloading it ahead of time and getting familiar with it before your visit. When you log into the app, follow these steps to link your photos to your account. When you select Link Photos you will be given two options: Link Attraction Photo & Link PhotoPass card. To link an attraction photo simply input the 8-character attraction id that was shown on the TV after the ride into the app. To link a PhotoPass card you will scan the code into your phone using your phone’s camera feature. The Show PhotoPass Code feature is a great way to save time and hassle at the parks. Rather than messing around with a pocket full of PhotoPass cards from photographers, simply show them this code on your phone. They will scan it and viola! Your picture will appear instantly. You can also use this code to access your photos at the PhotoPass Sales Center. Overall, most guests have a great experience with PhotoPass. But sometimes mistakes can happen and photos may not show up even after a photographer linked them to your account. This tragic incident happened to us on our last visit! Our images from our character dining did not show up on my app even though the photographer linked our photos using the PhotoPass code. Once I got home after our trip, I called the PhotoPass help center to see if they could find my image. And they were beyond helpful! The amazing cast member I spoke to spent hours looking through all the character dining images from the date and time I gave her until she found us. She quickly sent me the photo by the end of the day. If this ever happens to you in the parks, don’t be afraid to ask the PhotoPass customer service cast members for help! They are more than happy to help find your photos. You can go directly to the PhotoPass Sales Center in the parks (there’s one in each park) or visit the PhotoPass website. Make sure you are ready with a date and estimated time- this will help them find your photo quicker! These are photos you’re going to cherish for a lifetime! Make sure that you take the time to ensure you’re getting the best photos to take home with you. Here are some tips for getting that perfect PhotoPass photo. Ask the characters for pose ideas, they will be more than happy to show you their signature pose for the camera. Rather than having 20 pictures of simply standing next to the characters, incorporate some matching poses for added fun. Kids, especially, love to do this. If you’re taking advantage of your park hopper or Disneyland Resort Hotel privileges, you’ll be in the parks for Magic Morning/Early Magic Hour. While this is a great time to ride attractions, it’s also a great time to get fantastic pictures! This is the one time in the day you can get a perfect picture in front of Sleeping Beauty’s castle with NO crowd in the background. How cool is that? Remember, these PhotoPass photographers are professionals! Ask them for advice on how to pose or stand for your pictures. They will be more than happy to oblige. This is always easier though when there’s not a huge line behind you for a photo so make sure you take that into account. Make sure you ask the photographers for some Magic Shots! These are so fun and you don’t want to miss out on them. Basically, the photographer can put a digital image of Tinkerbell or other Disney characters into your image. Then your group reacts to it! They’ll guide you through the process and the result is typically a really awesome picture! Don’t be shy, get into the fun. One of our favorite park pictures is my son and I holding Tinkerbell in our hands with our mouths wide open. It’s so silly and great. It ended up being one of my favorite pictures of us from our trip! We always recommend being comfortable at the parks because of all the miles of walking you end up doing! However, that doesn’t mean you shouldn’t also dress savvy for your park pictures! If you’re staying in a close by hotel and have multiple days to take advantage of, you can always dress up a bit in the morning for your pictures and dress down in average park clothes for the evenings. You’ll be happy you did if you have a few pictures of your group looking fresh and nice first thing in the morning. And don’t forget to take off your sunglasses for a few photos so your face is visible! It’s always best to get those perfect PhotoPass pictures first thing in the day with kids. Your kiddo will be happier, cleaner, and it makes for a better experience for everyone. Trying to force your overheated, sticky, and cranky toddler for a picture at the end of the day will not end in a glorious picture. Although, it may be a funny one! I love collecting Disney pressed pennies! My favourite Disney souvenir has to be those Mickey Ears! I have a growing collection. I do love getting clothing that is specific to areas of the park or resorts!